In December 2012 the United Nations General Assembly adopted the Principles and Guidelines on Access to Legal Aid in Criminal Justice Systems by unanimous consent in Resolution A/RES/67/187. 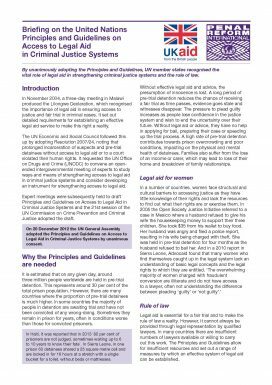 This briefing provides the background and reasons for why this soft law document is needed for ensuring access to justice. It also summaries the content of the Principles and Guidelines, and what actions are required by whom.